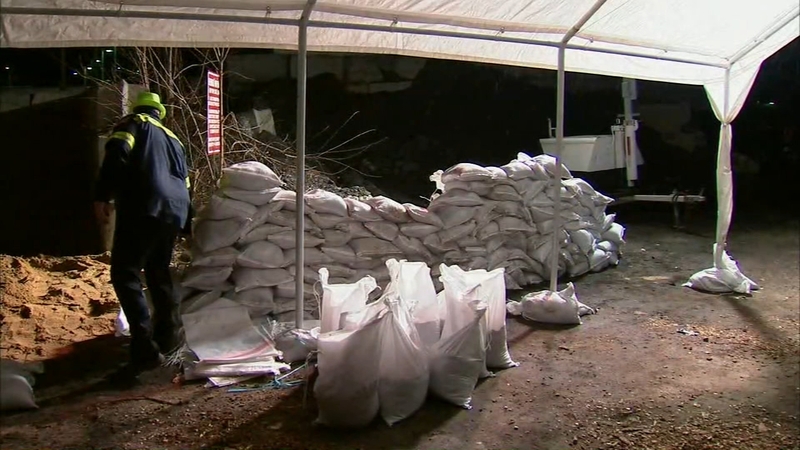 Sandbags were handed out to residents in Yonkers Thursday night in preparation for the storm. NEW YORK (WABC) -- Communities throughout the Tri-State area are preparing for the effects of a major nor'easter bearing down on a large swath of the East Coast. Gov. Andrew Cuomo activated the state's emergency management apparatus ahead of the storm expected to dump more than a foot of snow on parts of New York. Cuomo announced Thursday that regional emergency operations centers from Long island to Buffalo will deploy resources during the nor'easter bringing rain, high winds and heavy snow. Snow was falling in western New York Thursday evening. Forecasts call for rain turning to snow as the storm advances from west to east across the state into Friday. The National Weather Service has issued a winter weather warning for most upstate counties, with snowfall totals ranging from a few inches in some areas to as much as 16 inches in higher elevations. Authorities say heavy snow upstate and high winds downstate could cause widespread power outages. New Jersey Transit says it will be cross-honoring tickets during the storm. PATH plans to operate regular service on Friday, but is making preparations to install flood protection if necessary at its Hoboken Station, the most vulnerable station to flooding. Several major airlines offered passengers a chance to change their tickets for Friday and Saturday flights without a penalty. The nor'easter is expected to cause flight delays and cancellations throughout the Northeast. The Port Authority will activate its emergency operations centers to monitor storm conditions, and said it has made plans to provide busing in the event that service on AirTrain Newark or AirTrain JFK must be suspended due to high winds. At LaGuardia Airport, which sits along Flushing Bay, Port Authority staff secured cranes and other construction equipment being used as part of the airport's redevelopment program. Regional power utilities said they had extra crews on standby to deal with expected outages. Across the East Coast, authorities told residents of coastal communities to be prepared to evacuate if necessary in advance of Friday morning's high tide.